If you’re a resident if Pitman NJ, you can rest assured you’re getting top-quality home improvement services from Homecraft® Inc. Our roofing, siding, replacement windows, doors, and gutters are the best in the industry, installed by extremely skilled contractors. Using our 30 years of experience, we stand behind leading best practices and warranties so you get long-lasting life out of your products. 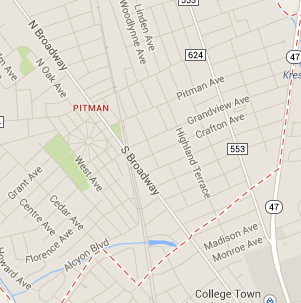 We are especially proud to provide comprehensive services in Pitman NJ, a formerly dry town that is home to 9,000. This borough located in Gloucester County is home to Pitman Grove, which is listed on the National Register of Historic Places. We know you are proud of your town. So are we. Let us use our experience and knowledge to improve your home in Pitman today, offering the following services. All set with throwing money away with inefficient windows? Get new, state of the art windows that save you money and keep your home comfortable all year long. Our vinyl replacement windows by Homecraft® or wood replacement windows by Andersen® will give your home a whole new look. The doors on your home should provide an open welcome for family and visitors alike. For new doors in Pitman NJ your best choice is Homecraft® Inc. We can design a brand new entryway with a rugged, durable entry door; replace a balky old patio door with a smooth-operating new sliding door; add a weather-resistant storm door to protect your home; or even replacing your rickety old garage door with a beautiful new automatic door. It’s no wonder we are among the leading door companies in Pitman NJ! We are proud to offer you the biggest selection of materials, textures, styles and colors when it comes to siding for your Paulsboro home. Extend your home’s life expectancy with siding that will protect your home and give it a beautiful, transformative facelift. As your trusted GAF MasterElite™ roofing contractors, we bring that honor to every roofing job we do. We know it’s hard to choose a trustworthy roofer but you can rest easy with us because we stand behind every roof we install with Golden Pledge™ warranty protection. We guarantee installation of dependable roofing systems from Homecraft® Inc. that will protect your family for many years to come. Gutters must be able to perform one solid function: get your rain water off the roof without getting clogged in debris and without harming your exterior or surrounding landscape. When you invest in Homecraft gutter systems that work in conjunction with your roof in Pitman, you enjoy peace of mind in all weather. Whether through a renovation, repair or addition, our home improvements are second to none. We help you add value to your property, from projects involving kitchens, garages, and even décor updates. FREE Estimates on Pitman NJ Home Improvement, Windows, Doors, Siding or Roofing. Call Homecraft®, Inc., today at 1-877-494-0377 to schedule a FREE in-home consultation and estimate for your Pitman NJ home improvement project, roofing, siding, replacement windows, doors, or gutters.